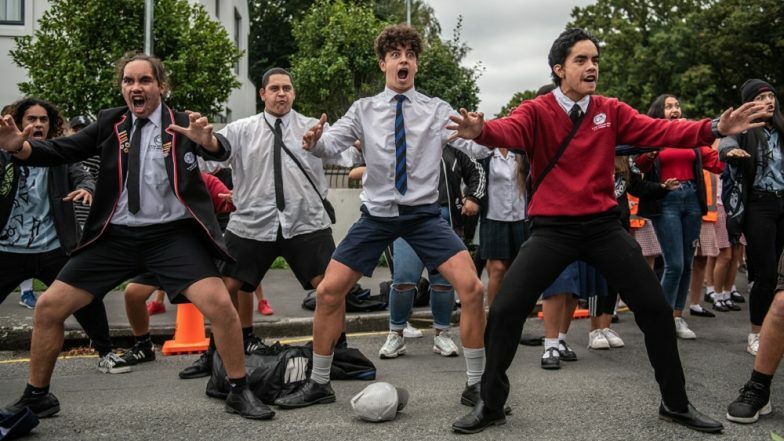 Christchurch, March 19: New Zealanders are gathering to thump chests, stomp feet and stick out their tongues - staging impromptu performances of the haka war dance to show solidarity with a Muslim community shattered by the mass shooting in Christchurch. Kiwis ranging from heavily tattooed bikers to business executives, children and the elderly have lined up to perform the intimidating ceremonial dance which begins with fierce chants roughly translated as "I Live! I Die!" As the country struggles to respond to the horrific tragedy, it was perhaps inevitable that many would turn to the haka - a dance whose origins lie with the indigenous Maori community but which has become a global symbol of New Zealand as the battle cry of its national rugby team, the All Blacks. The aggressive ritual and threatening histrionics may seem out of step with the sombre atmosphere gripping the nation after Brenton Tarrant, a 28-year-old Australian and avowed white supremacist, allegedly gunned down 50 Muslims during prayers last Friday. New Zealand Mosque Shooting: 4 Held for Attacks on 2 Mosques That Claimed Lives of 40 People. But the haka is not only meant to intimidate, but also to mourn, melding both hostility and beauty into an outpouring of true emotion, said Te Kahautu Maxwell, a professor of Maori at Waikato University. "Haka is used for death and mourning. It is an integral part of the Maori mourning process. Haka is used to show love and compassion. Haka is used to uplift the spirits of bereaved families," Maxwell said. With their eyes bulging while bellowing out the ritual's loud rallying cries, tattooed members of one of New Zealand's biggest criminal biker gangs joined with local children to channel that emotion through a haka for relatives of the dead gathered near Christchurch hospital this week. New Zealand Mosque Shooting: Air New Zealand Cancels at Least 17 Flights in and Out of Christchurch. Other haka performances have burst forth across Christchurch and elsewhere in the country as well as in Australia, where large communities of New Zealanders live. The haka stirs strong emotions in shooting survivor Kawthar Abulaban. She was in Christchurch's Al Noor mosque when the shooting erupted, eventually escaping through the back door. In the days since, she has repeatedly watched videos of the haka performances staged in response to the massacre, welling up each time. "Because you can feel it when you see them. You feel it, it touches your heart. Every time I see it I cry, it means too much," she said. According to Maori legend, the haka originated at the beginning of time as a gift from Tanerore, the son of Tama-nuira, the sun god. "Just as heat haze shimmers on a hot summer's day, in the haka all parts of the body shake from the crown to the soles of one's feet," Maxwell said, describing the intended meaning behind the dance's movements. Lisa Tumahai, who heads the Ngai Tahu, the main Maori iwi, or tribe, on New Zealand's South Island, said it was a natural reaction by Kiwis looking to show support for their Muslim neighbours. "No matter how angry or scared we are feeling at the moment, we must come together as one strong community to show care and compassion for those who made Aotearoa their home and who have now lost precious loved ones," she said. Aotearoa, or "land of the long white cloud", is the Maori name for New Zealand. In a further show of solidarity, the New Zealand government invited a Muslim imam to intone the Koranic bismillah in praise of Allah at the opening of the parliamentary session on Tuesday. New Zealand Prime Minister Jacinda Ardern followed up by saying "Wa alaikum salaam wa rahmatullahi wa barakatuh" -- "May the peace, mercy, and blessings of Allah be with you too." Schools, Maori tribes and sports teams will each have their own haka, and the version performed by the All Blacks, called "Ka mate, Ka mate", tells of a 19th-century warrior, Te Rauparaha, who hid in a food storage pit to escape his enemies. Maxwell said the haka reflected the overwhelming sadness following the massacre, as Kiwis grapple with the "fact we have been invaded and this terrible act has been committed on our shores." Maxwell added that as Muslim victims came under fire last week, "you can imagine they were thinking 'am I going to live? am I going to die?'"